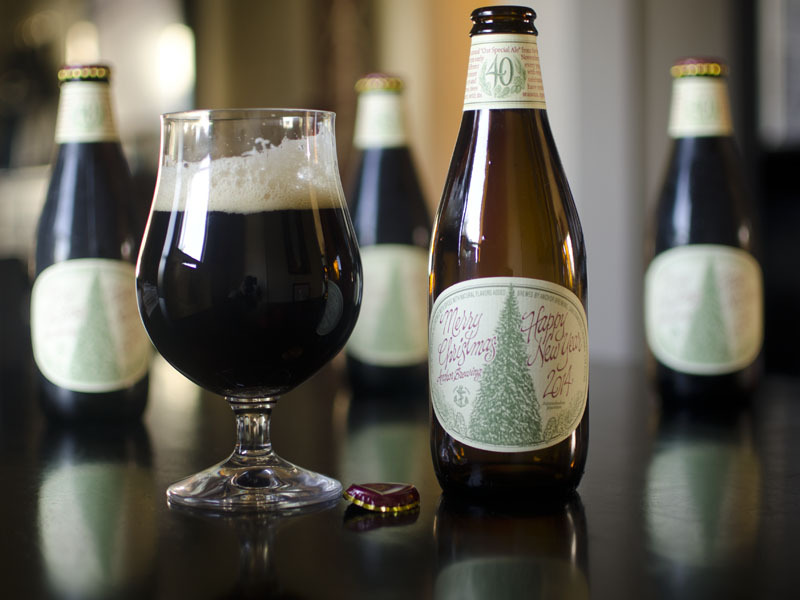 The 2014 version of Anchor Christmas Ale marks the 40th annual release of this seasonal beer. Photo by Jon Page. Because of the year printed on the label, some like to age Anchor Christmas Ale. But sample it fresh and bright flavors jump from the glass, each note standing on its own. I found this year’s offering especially complex: prunes, root beer and licorice come out in the first sniff. A second, deeper smell brings warm cake donuts and rich brown sugar with a toast-spice accent: roasted chili pepper or maybe singed cinnamon stick. On the palate these notes are joined by mild unsweetened chocolate, a faint suggestion of cherries and mint-like freshness. The long finish finds balance in a minerally bitterness which seems to combine both alpha acids and herbal notes. With all this joyful flavor, this year’s offering should bring joy to Santas of every stripe!